Cosmo Cricket Material Girl and a giveaway! When I think of Cosmo Cricket the first thing that comes to mind is bright, fun, happy patterns and the Material Girl collection is no exception. The crafting kit includes 12 designer papers, 18 cut-apart element cards, 8 cut-apart borders, 19 cardstock stickers. I was a little wary of the kit at first because I generally steer away from themed collection - I mean how many sewing layouts am I going to make? But I found that this collection was versatile enough to be used in all kinds of layouts. It has a little vintage flair which is very popular this year. 1. I love double sided papers and Cosmo Cricket gets an A+ for their B-sides, very usable patterns. I love the clean, bright colored vintage-inspired papers in particular. 2. The cut-apart borders provide a great way of using a lot of different patterns in your projects without using a lot of paper - love the ease of use! 3. 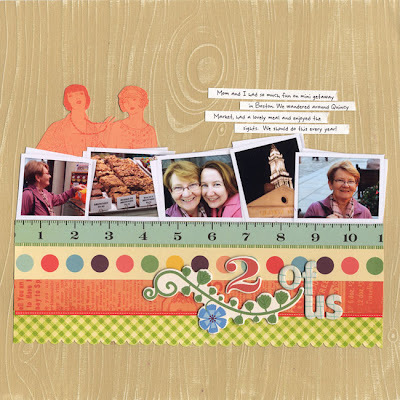 Cute, cute, CUTE chipboard elements with enough theme and non-theme images to satisfy anyone. And they actually stick, which can't be said for all adhesive-backed chipboard! 1. As I mentioned before, I'm not a huge fan of "theme" papers but the B sides of the papers saved the day. 2. I wish the cut-apart element cards were pre-cut - that's just a personal preference on my part. 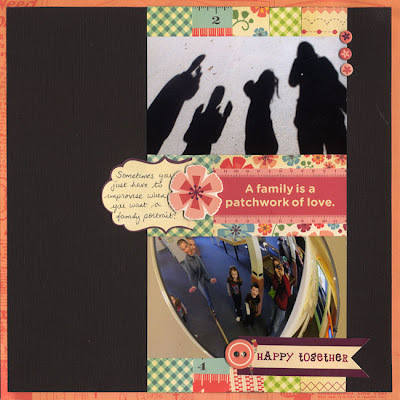 I used the cut-apart borders here - so quick and easy! Another non-sewing themed layout but I wanted to use one of the cut-apart element cards for my title. The chipboard elements add a lot of oomph to these cards. I went with the sewing theme with one. The other has a paper pieced cupcake covering up a pair of scissors! 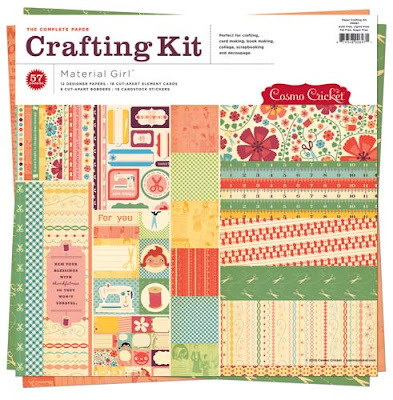 Supplies: Cosmo Cricket patterned papers, chipboard and cardstock stickers, Core'dinations cardstock, SRM stickers, American Crafts brad. What do you think? Do you like this sewing themed collection? What would you see yourself using this line for? Leave a comment by midnight EST Tuesday to win a Cosmo Cricket prize pack! I love these papers! They remind me of my grandmother who was always busy sewing something pretty for one of her grandchildren. I like Cosmo Cricket and this is a cute line. I don't see myself doing a lot of sewing LOs so I am glad to hear that the B sides of the paper are less themed. Great job on showing that this can be a versatile line. Cosmo is one of my fav. manufacturers. I love this line! My daughter takes sewing classes so this line would be perfect to scrap those photos! I really like this collection. I hope I win! I don't really sew, but I do needlepoint. I don't see myself using it for that though. I think it's versatile enough to use with lots of different photos. I love the colors! Thanks for the great tips and the chance to win. I love Cosmo Cricket. They always have the funnest patterns. 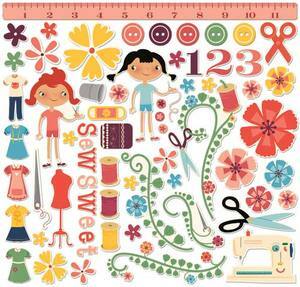 I have love to sew and I have 3 girls so this kit would be used a lot! Hard for me to find a cosmo I don't love. I agree that the colors are great fun. Really in love w/ Material Girl. These are so cute. I think I'd start using it by scraplifting all the cute LOs and cards in this post! I like anything Cosmo Cricket!!! I can totally see myself using this line. I love your reviews. I agree with the overly themed paper. I always feel like I could use them for one thing maybe. Using little bits of the patterns are really cute though. I haven't been able to use much of Cosmo Cricket in my crafting yet. Cosmo Cricket is one of my most favorite companies!! They're products are fantastic, and the people who work there are wonderful!! I always look forward to seeing what their next release is. This kit seems great for those 70's photos from my childhood. My mom used to make matching dresses for my sister, me and herself... this kit would be perfect for those pictures. you rock. :) it was fun watching you make these! I absolutely ADORE this line! Of course, I sort of love all things Cosmo Cricket! LOL! I would use it for mixed media stuff and cards mostly! I absolutely love Cosmo, especially these papers. Perfect, so many options. I LOVE LOVE LOVE this set! I would love to win this. Cosmo Cricket is one of my faves, but this sewing stuff is way too cute. I would love to do scrapbook pages of my hobbies and for my daughter using this line. I am with you, I would probably use the reverse side - CARDS - I would use on cards! I love Cosmo Cricket papers. They are so bright and cheerful! I would probably use Material Girl for a scrapbook page about my mother--who used to sew all of our clothes. It would also be cute on a little fashionista page or even to show a page about how I love to scrapbook--paper is so much like material, etc...I would also use it on cards. Thanks for a chance to win! I just adore this line! I'd make a few things for my moms sewing machine. She has spend endless hours making incredible quilts and other things for me, I'd love to make something nice for her! I love Cosmo Cricket and this line is devine. I'm hoping to start learning to sew soon so this would be perfect to record my journey. I love Cosmo Cricket and these paper kits, makes it so easy, but I really don'e care for this theme! Love the layout and cards you made. As a seamstress and scrapbooker I love when my two hobbies can be combined. If I could find doll scaled paper or fabric with scrapbooking or sewing frogs, I'd be in heaven, but I'm doubting that will happen. LOL! I've recently discovered Cosmo Cricket, and haven't been disappointed yet! Love the papers and the colors. And even though it is a sewing theme I think it would be very versitile.Espically for cards for freinds who sew. I absolutely love Material Girl! I received a few sheets of this line of papers in one of my kit clubs and it is totally awesome!!! I'm going to pick up the rest of the line since it's soooo useful and versitile. (maybe I'll win it firs..wink). Your projects are sew beautiful!! I love Cosmo Cricket! When I first saw this line I dreamed up a layout using photos of my daughters 1st haircut. I love the colors in these papers and you showed just how versatile they can be! Thanks for sharing and having another great give away! I have a few pieces from this line and love them! I'm a huge CC fan!! Cute set and I love what you did with it! THis is a super cute collection and I could see myself using it to make gifts for my friends who like to sew. I love this collection, the colors are so fun. Thanks for a chance to win. Paula, thanks for showing the many uses for this line. I think I would have to use them much the same way. I love LOVE the color scheme of this...very cheerful! I LOVE IT!!! Thanks for the chance to win!! I love sewing just as much as I love papercrafts, so a sewing theme kit is actually a great one for me. I would use bits to embellish sewing-notion boxes, and to make notecards for fellow stitchy friends. I love, love Cosmo Cricket and this line is just adorable...love your projects with it, too!!! Sweet!!! first of all, Paula, i just want to compliment you on the PHOTOS of that family fun layout - they're SO fabulous! love the funhouse mirror shot paired with the shadow. clever, and inspiring! I would love to use this in a few minibook projects for some of my relatives. There are tons of old photos that i've been looking for the perfect line to use! Material Girl is IT! Very cute line! Thanks for the chance to win. I own some of the pieces to this line and LOVE it. I fondle it frequently LOL. I know that I will find the perfect layouts with my crafting buddy SIL who loves sewing and I tolerate it. This product line is so fun: It reminds me of the Russian and German children's art from the late 1950s and early '60s. Oh, I love this charming line of paper! So many possibilities. Thanks for giving us a close-up look at it and sharing a few of your layouts! These papers are so cute! With 2 little girlies, I'm sure I could find a use for them! I sew on just about ALL my projects and I LOVE Cosmo Cricket! Perfect! I can see myself using this line for cards, scrapbooking and altered art. I just love anything sewing. Would love to win it. Thanks for letting me play. God bless! I, like you, would probably only use the "B" side of the paper. I've been sewing for a long time so I love this sewing-themed stuff! So cute! I LOVE this paper, and I love Cosmo Cricket. I love the B sides of the paper as well, it always balances the more quirky designs for me. I love this line. I would make a mini book about my grandmother. She was such a crafter! I love this line. The colors are so playful and the patterns make one happy. My niece just learned to sew and I am making her a sewing kit. These papers are perfect for her personality. Oh I simply cannot live without anything that Cosmo Cricket makes. I don't care if it's in season or not. I always buy it!!! I love anything CC and you are right, the B sides are fantastic. I would like to win this collection because I have some great photos to scrap of me making my 1st quilt! I like how this is such a "happy" set. Thank you for showing how versatile this collection is. The card you made with the cupcake over the scissors is too cute! I love Cosmo Cricket papers, and this line is wonderful. My Mom was a wonderful seamstress and I am going to do a tribute page to her in my Granddaughter's scrapbook. I will have to have this collection. Thanks for the chance to win. Love this line so much! I don't there isn't antyhing Cosmo Cricket can do wrong!! 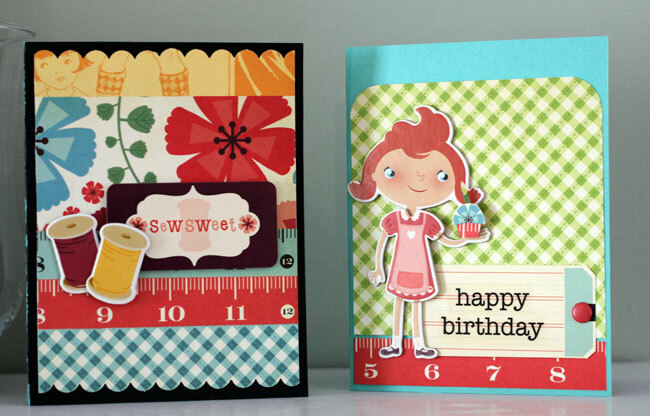 I just love CC papers - and this range is very cute! I love using tape measure papers on my LOs. I am a sewer from the beginning, so these papers are close to my heart. Would use them to make cards for my sewing friends, and my mother! I have girls and grand baby girls to scrap for so this would be wonderful for my layouts - thank you for the opportunity! Love your use of this pack. I'd love to put these papers to good use. Sew cute! I am not a big theme person either but I have loved this line because it brings back so many memories for me. My grandmother and my mother both loved to sew and most of my clothes as a child were made by them. I need to scrapbook some of these memories and this would be the perfect stash! Great projects, I really adore your shadow and mirror photos in your layout as well! I actually think I would use this collection to share about myself..I've never done this and I know I should...for the kids, you know? And it would be perfect for that. Thanks for sharing the ideas! this is such a great collection, and I totally agree with your review. Thanks for chance to win some CC! You just can't go wrong with Cosmo Cricket - they've produced yet another fabulous winner in my eyes! The first time I saw this line I thought the same thing, "how much am I going to use cartoon girls and sewing themes?" But the more I see it used the more versatile I think it is and the more I want every little bit of it! Sew cute! I think Cosmo Cricket does themes so very well - this is clearly evidence of that. I adore CC, they never disappoint! I really like Cosmo Cricket papers. This pack looks so cute and the little scissors on the papers are darling. I would use the pretty papers for scrapping and cards. Your layouts and cards are fabulous! So cute!! Love this line! Thanks for the chance of a giveaway. I go crazy for Cosmo Cricket! The Material Girl line is tops! Thank you for this awesome giveaway. I really need that line for my girlies. Thanks for the chance to win it. I love to sew so I love this line!! I would probably use this line to make a cute banner to hang in my scrap area! I so agree with you and I'm a Cosmo Junkie. However I was going to pass on this collection because of the theme until I saw Julie on HSN showing the reverses. I loved them and yes I ordered it. I just love the bright colors and versatility of this collection. Thanks for the chance to win. My teen has taken up sewing and these papers would be so perfect to make a little mini book with, just love em! love what u did with the products! I really like the theme of this collection. As a crafter, it would be so fun to scrapbook the making of my crafts with this collection! Thanks for the opportunity. Cosmo Cricket is the best! I'd totally be making some card sets to give as gifts to teachers at the end of the year...so cute to have coordinated note cards on hand! Love this line and what you made with it - that carstock is pretty awesome too! I have been dying to get my hands on this collection. Not only is it a super fun collection but I sew so it is perfect to decorate some of my plain sewing storage boxes! I'd LOVE to win!!! Thanks! I love Cosmo Cricut!! and this one is awesome! this is totally one of my fave lines that was released at cha this year!! i absolutely have no idea what i would do with all the 'sewing themed' stuff but i'd figure it out cuz it is way too cute not to use!!! love it!!! I SEW love this kit!!! I am wanting to make some cute pages to display in my studio or my daughter's room...love, love, love this line! thx for the chance to win! fingers crossed!!! so girly and lovely !!! All in this new line is fantastic, the colors, the vintage pattern, the girly design. I'm so in love with all this collection. I love Cosmo, i think there are funny and i love them basically because the themes can be used for adult photos or child photos. Other companys are funny too, but the themes of their papers are basicaly for kids. i like Cosmo for the quality of their papers too. I love this line! Thanks for the chance to win. I used this line for layouts of my baby girl and they turned out adorable! I also made a bunch of cards and used the sewing theme for those. Love it! So sad that I've used it all up! This line is adorable and perfect for telling my story about sewing with my mother and grandmother while I was growing up. Thanks for the chance to win. This material girl really likes the fun theme and bright colors in this kit. Thanks for the chance to win. I love Cosmo Cricket products! They're adorable and the colors are fantastic! Cute projects! I love the measuring tapes for some reason even though I'm not really into sewing. I also like their b-sides a bit more (usually) than the theme-y fronts. I really like this collection. I find the girls to be a little odd, but I love everything else about it. I think this is one of the cutest lines I've seen in a while. Adorable! I love Cosmo Cricket...with two sided paper you have your choice as to which paper to use. And I like the way the chipboard pieces give the pages dimension. I don't sew, but I could see these papers working with crafty or girly papers in general. I have loved everything that Cosmo has been putting out lately, ever since the Snorkel line I have been hooked! To be honest, I think these colors are even well suited for men's pages. They also use scissors and the patterns like the woodgrain is very masculine indeed ! I have so many pictures of my daughter that would go so well with this line! I love Cosmo!! This is my season cosmo cricket favorite line this usar ! I jus luv them!! And I luv the way that u use the paper without being tematic. Thanks for showing us how versatile this line could be. They are something cute! I would love to give them a try!!! Love this paper collection! It reminds me of when I was a little girl and my Mom would sew for my twin sister and I.
i totally love this collection...it has the homey "sewing" feel without me having to take out my clunky machine! I can take my pictures of things I sew and scrapbook it or special items i have sown fo rhe girls. I am in the middle of making a quilt for Christy.